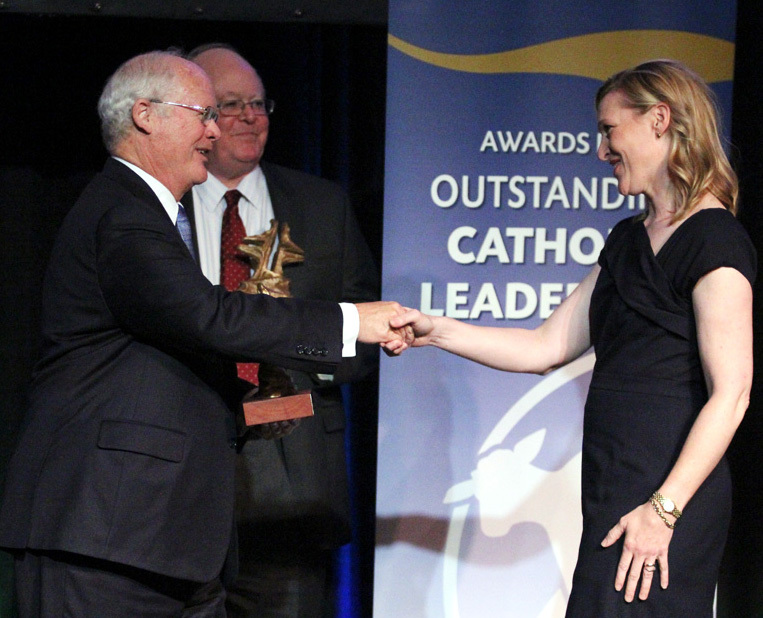 Timothy C. Flanagan, founder and chair of Catholic Leadership Institute, presents an award for outstanding Catholic leadership to Lisa Brenninkmeyer, co-chairman of the board and founder of Walking with Purpose at the 2012 awards banquet Nov. 9. Catholic Leadership Institute honored four individuals for their outstanding Catholic leadership at a banquet Nov 9 in Drexel Hill. The honorees are Lisa Brenninkmeyer (co-chair of the board and founder of Walking with Purpose), William Donohue (president and CEO of the Catholic League for Religious and Civil Rights), Father Jack Wall (president of the Catholic Extension) and Sister Angela Ann Zukowski, MHSH (director of the Institute for Pastoral Initiatives and professor of religious studies, University of Dayton). 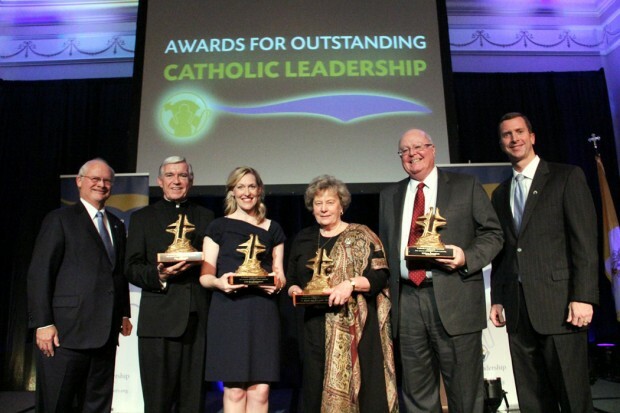 Catholic Leadership Institute developed the awards for outstanding Catholic leadership in 2000 to recognize people in the Catholic Church whose exemplary leadership in the family, workplace, community and Church has been inspired by their Catholic faith. “Catholic Leadership Institute is blessed to honor these outstanding Catholic leaders and Christian witnesses for their commitment to living and sharing the Gospel with passion through their most unique and important ministries,” said Timothy C. Flanagan, founder and chair of Catholic Leadership Institute. The event drew more than 500 guests, including bishops, priests and Catholic leaders from around the country. For more information about Catholic Leadership Institute visit www.CatholicLeaders.org.